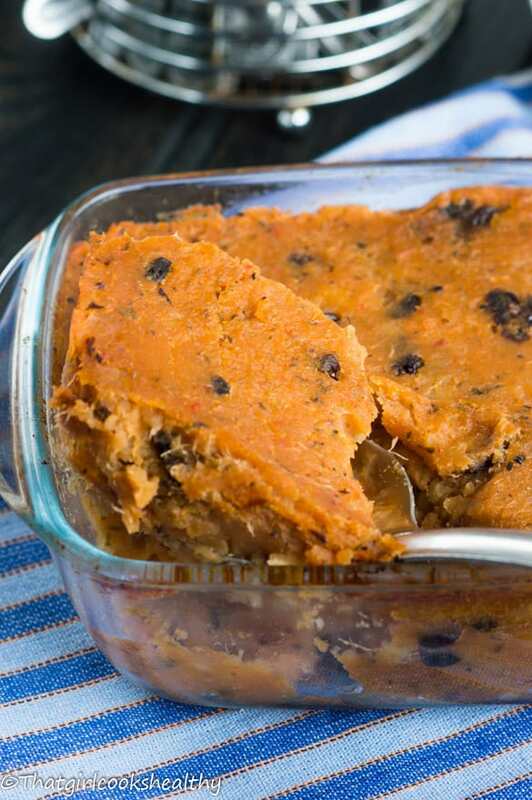 Potato stuffing – A tradition Virgin Islands recipe consisting of Caribbean sweet potato, raisins and vegetable served on the side for thanksgiving. One of the things I LOVE about blogging the most is creating recipes from different Caribbean islands. Believe me when you’re a Caribbean foodie the culinary adventures don’t just stop at your own island, you extend it to exploring others. In this case I headed straight over to our brothers and sisters in the Virgin Islands with a dish called mashed potato stuffing. 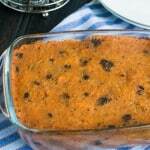 What is Caribbean style mashed potato stuffing? First of all let me just clarify something, you don’t actually stuff the potato into meat or otherwise, I know it sounds strange and contradicts the recipe name but we should respect one’s culture even if it’s not quite understood. Now that I’ve cleared that up, you’re probably wondering what purpose does this dish serve then? Good question! 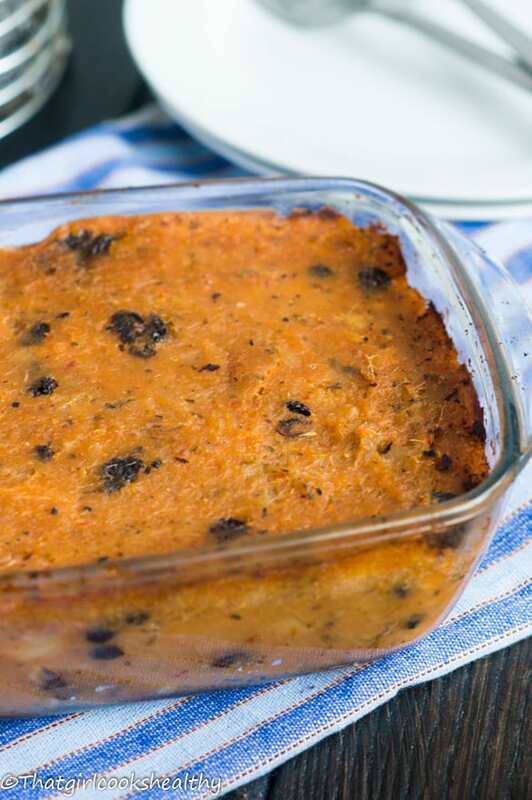 Well potato stuffing is more or less a side serving of starch, usually the people of the Virgin Islands will serve this at Thanksgiving or Christmas along side the main entree. With that being, there’s no reason why you cannot utilise this recipe as a potato filling instead. 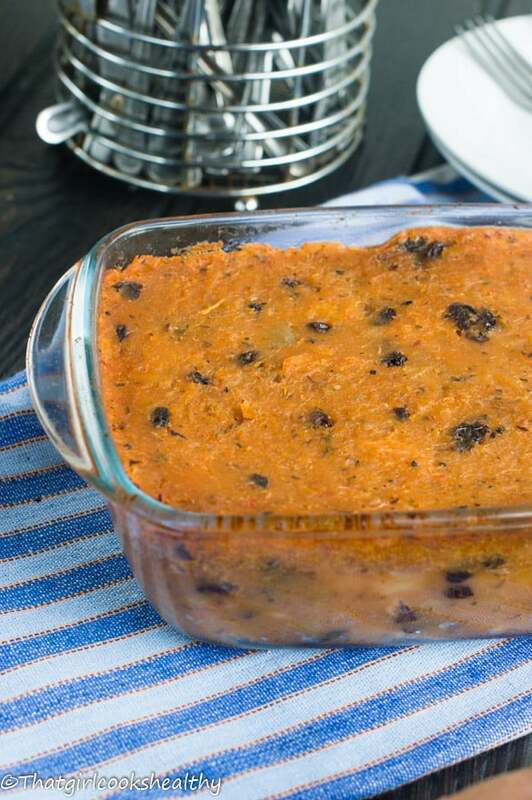 Each person has their own unique way of making this vegan recipe, regardless of how an individual prefers to make potato stuffing they are a few key ingredients – raisins, potatoes , tomato paste, onion and sugar. The other ingredients which I will list further down will vary, I like my potato stuffing with a medley of minced vegetables and mildly seasoned with thyme, parsley and a dash of cinnamon. When I first tasted this recipe I instantly fell in love with it, I love my tubers however I’m not a fan of white potato which is what is ordinarily used. The reason why I don’t eat white potatoes is because of how quickly it spikes the blood sugar levels, while white potatoes are somewhat nutritionally dense, fortified with minerals like iron, magnesium and vitamin C.
As previously mentioned the subsequent release of glucose is significantly higher compared to sweet potatoes and this is something to be mindful of especially if you are of African heritage where high blood pressure is a growing concern. I used white sweet potatoes (see above) rather then the orange ones, because they’re not as sweet as the aforementioned, they make a great healthy substitute without compromising the taste. I also enhanced the sweetness with coconut sugar rather than white or brown sugar which hold no nutritional valve. If you have been following my recipes for a while then you will know that I’m a huge fan of low GI index sweeteners and coconut sugar certainly qualifies. This recipe doesn’t require much prep work, the vegetables listed only require pureeing and sauteing in the pan. If you like chunky pieces of veg by all means, roughly chop them, however in my humble opinion I think pureeing the veggies really helps to bring out the flavour. C’mon what are you waiting for? You must try this VI dish, it’s vegan, no gluten in sight and paleo friendly. Preheat the oven at 170 degrees celsius or gas mark 4. 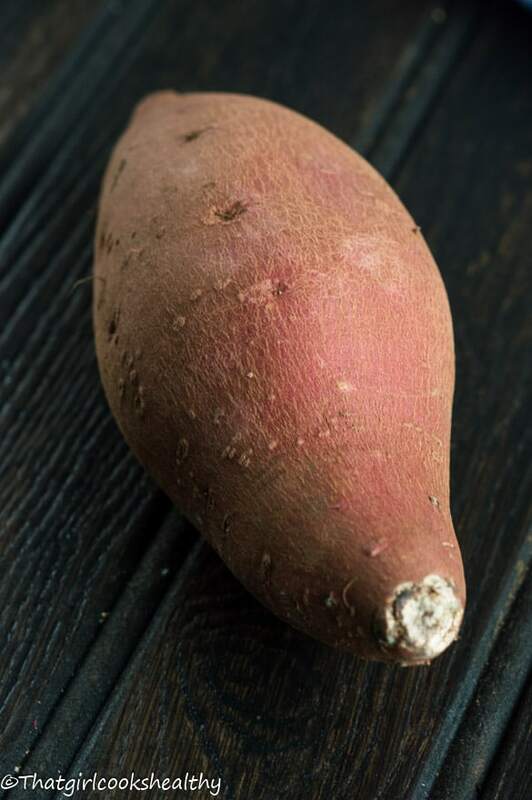 Wash and dry the white sweet potatoes before proceeding to peel the potatoes using a paring knife. Roughly chop the potato into chunks before adding them to a large pot of water. Add enough water to the pot so that all the potatoes are completely submerged in water. Bring the pot to the boil and cook the potato chunks until tender. This should take approximately 10-12 minutes, Be sure to determine the readiness by pricking a piece of potato with a fork. It should be soft to the touch. Drain off the excess water and use and potato masher to break down the potato chunks and incorporate the butter. On medium heat add the coconut oil and begin to saute the onion and garlic for 30 seconds. Quickly add the bell peppers, celery and raisins and cook for 1 minute. Add the coconut sugar, tomato paste, thyme, black pepper, salt to your taste and cinnamon. The contents in the frying pan should take on a red hue. Continue to toss and rotate the pan for another minute before removing it from the stove. Pour the sauteed ingredients in with the mash potatoes and use a folding technique to ensure the fruit and vegetables are fully incorporated, note the potato should be a subtle red hue. Transfer the potato stuffing into an oven proof dish, using a knife to evenly distribute the mixture, it should resemble a deep pie. Bake in the oven for 45 minutes until golden brown with a thin crust. Remove and allow to cool before serving accordingly. Sounds and looks delish; definitely will try it, though I may use the regular white potatoes just because I have plenty at the moment. Curious though is it from BVI or USVI (or both)? Thank you! According to my research both islands embrace potato stuffing although it seems to be more popular in the US virgin islands. Thanks for sharing this. 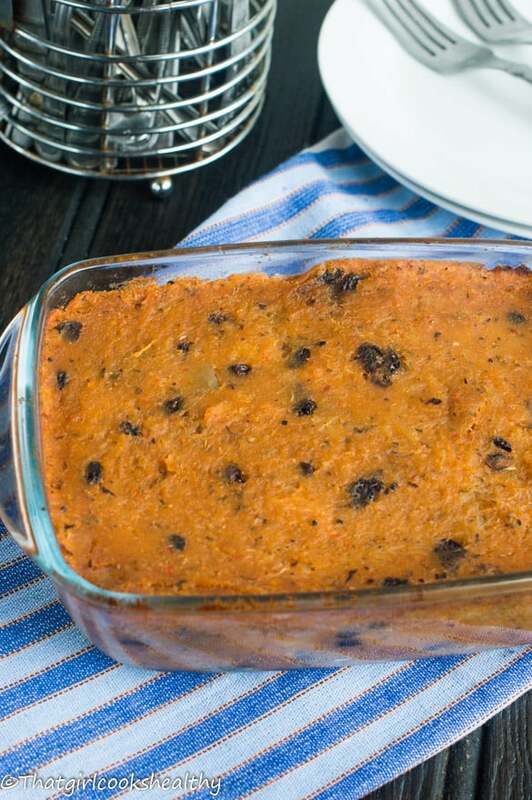 I’m from the VI and have never tried using sweet potato for this recipe, which is one of my favorities. I’m gonna try it but want to taste it first before subjecting my Thanksgiving Day guests. Hi Lori. Thank you for commenting. Definitely give the sweet potato version a try. I’m sure you and your guests will enjoy it! I was reading your recipes with great delight! I asked my sister, Rita, who is now 85 years of age, why was it called potato stuffing. She said in the old days that when you baked a roast goat, you would stuff the cavity with the potato stuffing. She probably heard that from her mother-in-law, Grannie Schuster, who would be, perhaps, 130 years old if she were alive today. Maybe that’s how they did it when all they had was a brick oven rather than a modern day oven. In that way, it was probably more practical to just stuff it in the goat? Who knows? I never saw my mother do it that way. Nevertheless, just thought I would share that tid bit with you from long time days. Will continue reading your recipes. Thanks for sharing them. Hello Shirley, thank you so much for reaching out to me. I also appreciate the additional information that you have shared in respect to the origins of potato stuffing. This was very useful to me and I can certainly see why they would call it potato stuffing now, so lesson learnt! I hope you manage to try my recipes too!